An art historian friend visited recently and there was a concerted effort to show her the culture that Reading had to offer. Walking around Reading with an art historian you become much more aware of the buildings that you usually ignore. She had made the journey because of an exhibition at Reading Museum John Tweed: The Empire Sculptor, Rodin’s Friend. She had even got a copy of the catalogue in advance. It was great to see that the book was authored and the exhibition co-curated by a former University of Reading student, now art historian, Dr Nicola Capon. I couldn’t take photos in the exhibition but there are some in the link. Tweed is dubbed ‘The Empire Sculptor’ and archival documents provide a fascinating insight into how these kinds of projects were negotiated, and the role that they played in the expansion and expression of empire. His “ideal” statues are also just really gorgeous to look at. The same weekend I made good on a promise to visit an open studio, after my post on ‘slack spaces’ and artist run initiatives in Reading. After tweeting on that subject, Reading-based photographer Salvo Toscano got in touch to mention his open studio. He has some beautiful photographs from further afield but I was really drawn to the images from around Reading. Salvo lives not far from the Museum of English Rural Life (where I am based) and seeing local streets transformed by a photographer’s eye demonstrated the need to look again at my surroundings. It may be dangerous for somebody as clumsy as me to walk around staring up at buildings but I’m going to make a more concerted effort to stop and (don’t laugh) admire the beauty of Reading. Last weekend we had Museum Memory Day, Museums at Night and International Museum Day. It is fitting that on Friday I set myself a crazy day of running around the Oxford museums and libraries. 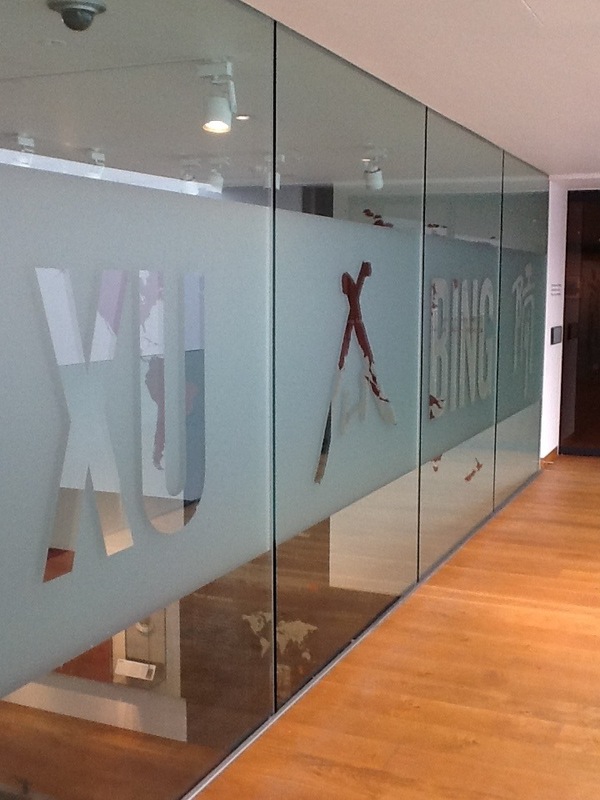 First off I popped into the Ashmolean to catch the Xu Bing exhibition before it closed. I had glimpsed the banners and mistakenly thought it was on traditional Chinese landscapes. The exhibition actually charted contemporary artist Xu Bing’s negotiation of socialist realism, pop art, French impressionist landscape painting, community art projects and calligraphy. His landscripts took centre stage. These are landscapes which use Chinese characters as marks to depict features in the landscape e.g. the character for rock to depict a rock. Maybe I’m weird but the early sketches made during the Cultural Revolution were my favourites. If you missed it there is a lot of highly quality online content still available via Eastern Art Online. 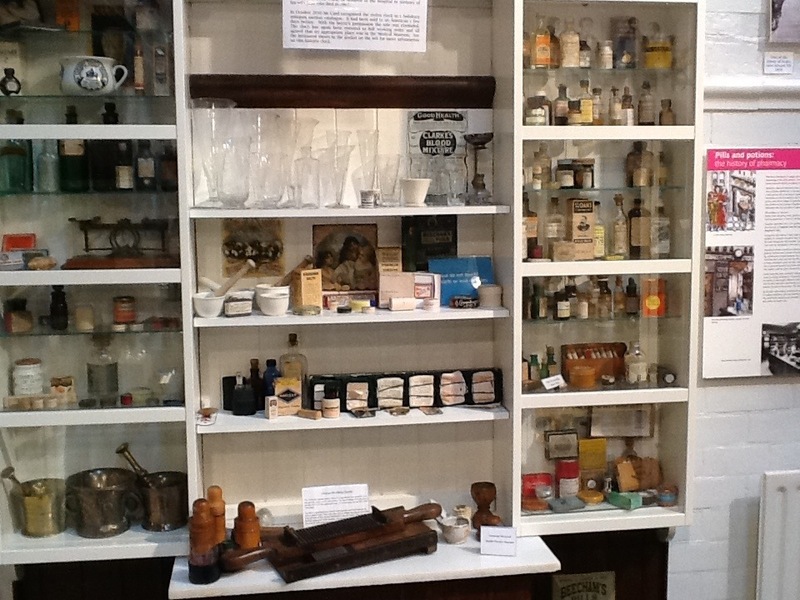 Then it was off to the Oxford Museum of History of Science. They only have a small temporary exhibition space which they always use to great effect. 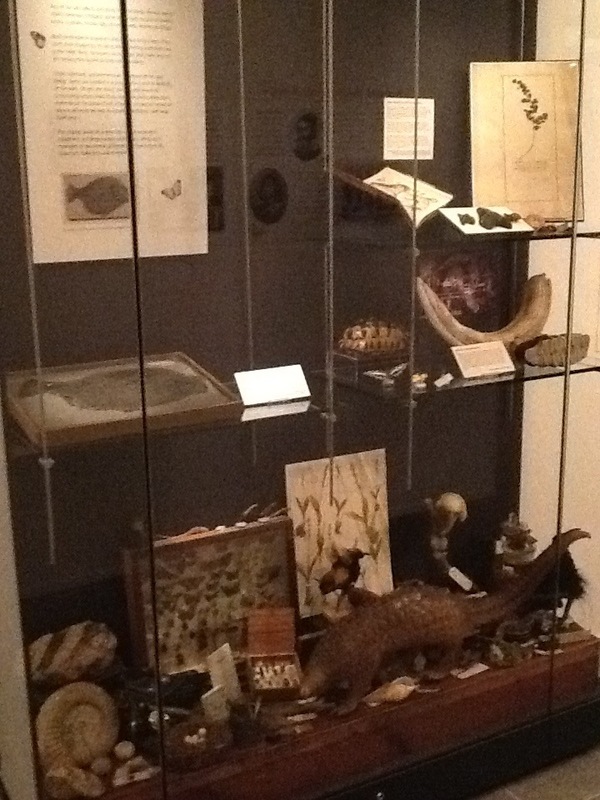 Their ‘Natural Histories’ exhibition used items from the currently closed Oxford Natural History Museum. 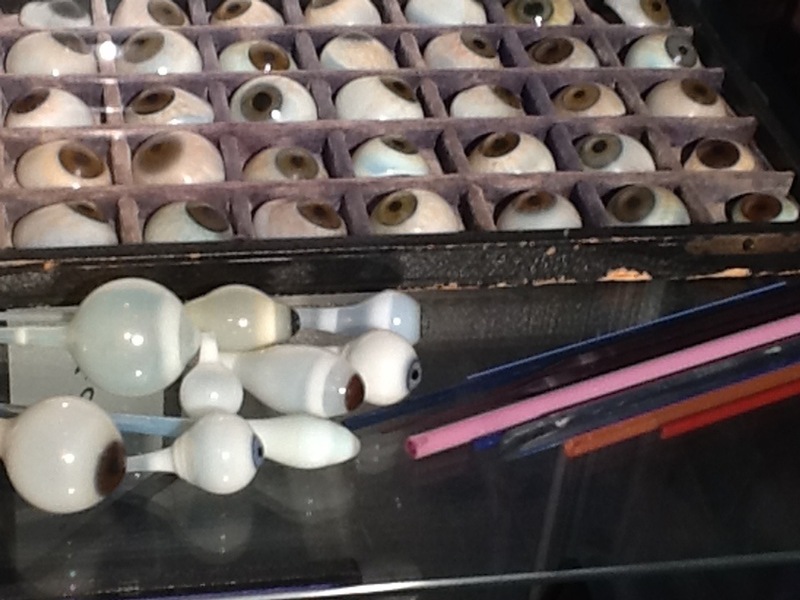 It explored the use of these collections for scientific research. The items which stuck with me were initially unassuming preparations signed by Darwin and Linnaeus. 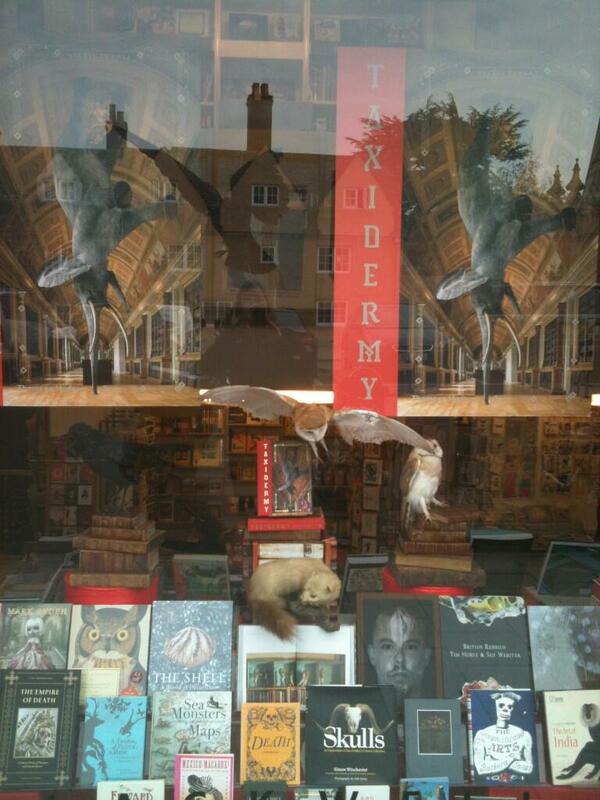 The display of the taxidermy really captured the romance of these collections and seems to have inspired the Blackwell art shop next door in their window displays. Quick lunch in the Ashmolean and then what I thought was going to be the boring part of the day: hitting the books. Turns out reading is a lot more fun when you can pretend to be one of the X-men as you move from historic building to secret underground facility. 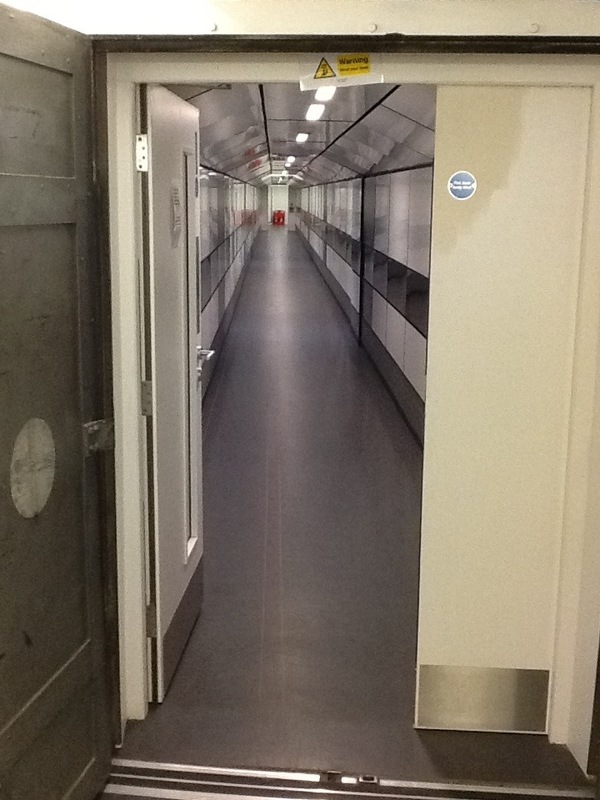 The Gladstone annexe is in an old book tunnel between the Bodleian and the Radcliffe Camera. I don’t think it’s open to the public but here is a sneak peek. Rounded off the day listening to the wonderful Jon Whiteley talk about the history of the Ashmolean for Museums at Night. The event also celebrated the launch of the new book about the history of the museum ‘Dodos and Dark Lanterns’ (Berry 2013). I had a train to catch so I only caught glimpses of what was on offer: live music, historic costume, lantern making with families. 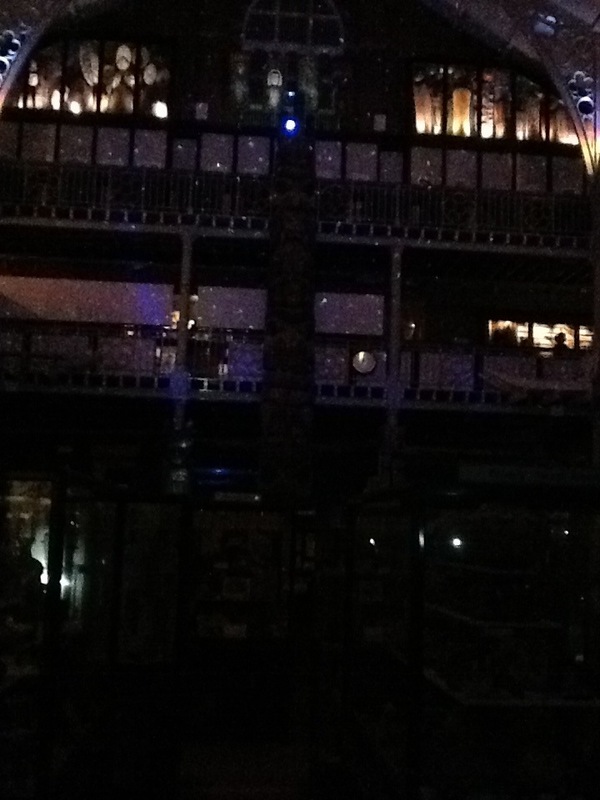 I then ran to the Pitt Rivers Museum to see it in darkness (again for for Museums at Night). The sight of the shrunken heads by torch light was particularly uncanny. It was worth the run and I only wish I could have stayed longer. What is your most memorable moment in a museum? It might have been when you had your first spark or the first time you went to a museum with your family. Maybe it was when you saw something in a painting that inspired you. Could be when you went to a museum with your grandparents. Perhaps it was a memory when you went back to a museum as an adult. My earliest memory of a museum is going with my reception class to the National Museum Cardiff as part of a day long outing which also took in Bristol Zoo. I vaguely remember a large dinosaur and an oversized bed bug which gave me nightmares. However, my strongest memories are of buying dinosaur stationery in the shop and one of my class knocking something over and having to go to the local A&E. NB this would have been around 1986 so I am sure H&S has improved since then and my class was probably a bit boisterous. I think about this when teaching as it reminds me that for many of our youngest visitors the content of the displays may be the least interesting part of the day. Leicester’s ‘What Did You Learn at the Museum Today?’ Project convinced me that I was not a 6 year old philistine. Flicking through my copy of the booklet ‘What Amazed Me Most at the Museum Today’ (MLA 2004) I saw that one child had listed the journey as the most amazing part of his day. In the analysis I found the following quote “children respond positively to the whole experience of the visit. The site, the journey, the activities, the facilitator and even the packed lunches are valued by pupils. All these factors combine to make the visit an engaging and stimulating break from normal school routines”. For me the social interactions, the unfamiliar scales and the experience of being able to *gasp* buy something for myself stuck with me. A slightly more inspiring story took place when I was 17 and applying to read Archaeology and Anthropology at university. As preparation for my interview my headmaster called somebody at the same museum. I wish I could remember the name of the kind member of staff who showed me around the store and let me handle a prehistoric axe. The sense memory of the axe stays with me and always springs to mind when people talk about the power of touch. 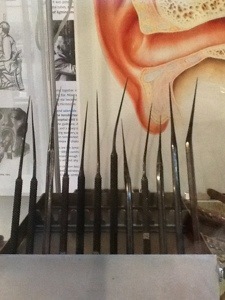 Just back from the Royal Berkshire Medical Museum. I’ve been there before but I always seem to forget just what a hidden treasure it is. 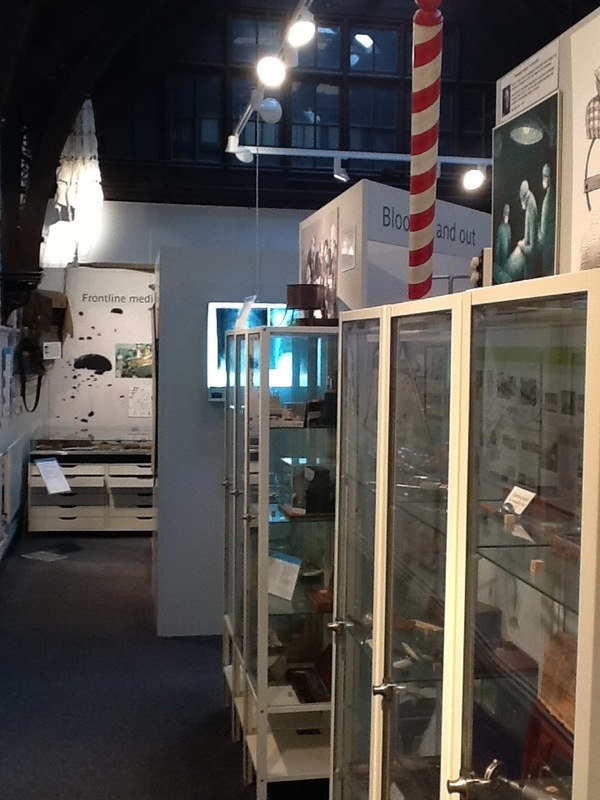 Tucked away in an old laundry room (Grade 2 listed), the museum is packed with fascinating stories and objects. 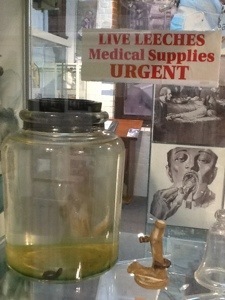 The key ‘object’ is the glass jar of living leeches that are ‘fed’ by the team of volunteers. 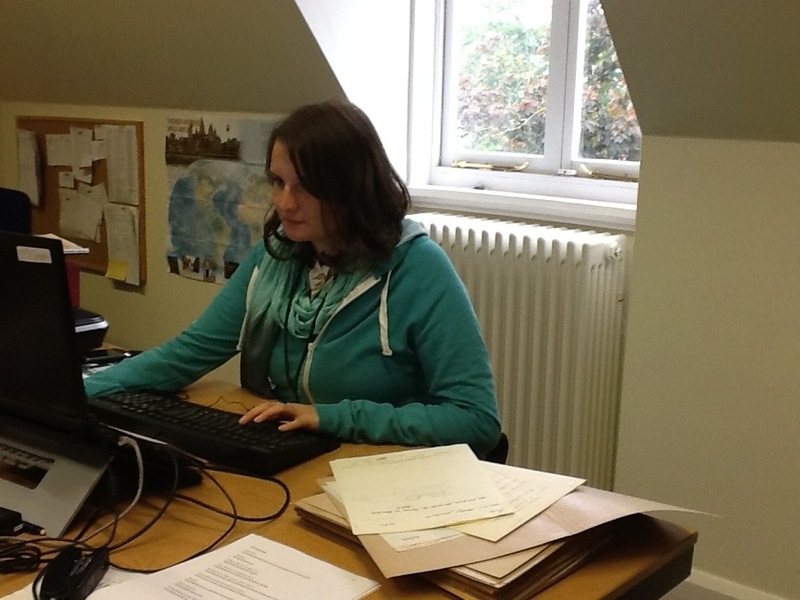 The museum is run by former members of staff on a voluntary basis. 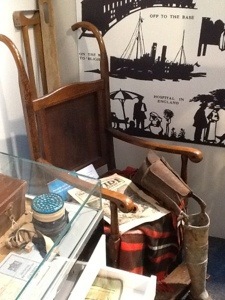 The current display was made possible by HLF funding in 2008 and the look is the result of a collaboration with local designer Martin Andrews. I know Martin from the 2005 Ure Museum redesign, and his ability to bring objects to life with a low key and low cost bit of theatricality makes him a really inspiring guy to work with. Take for example this low tech bit of reconstruction. However, the real stars are the objects. Weird, wonderful and a bit disturbing. One member of our group briefly looked up and started laughing at the faces everybody else was pulling. 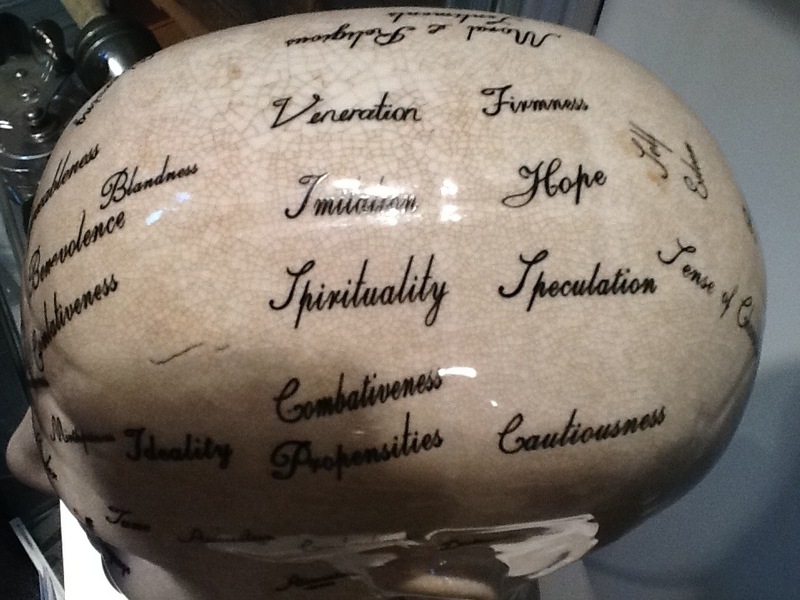 I love a museum that provokes a gut reaction (pun intended) and the universal subject of the body and medicine means that everybody has some kind of response. At the Society of Museum Archaeologists’ Conference in Manchester 2012 Dr Nick Merriman suggested that museums need to reach out to the geek audience. Museums have always struggled to bring in young people, so marketing and programming for an ‘unironically enthusiastic’ audience might be just what is needed. Studies of visitor figures from around the world show that, as a general rule, you stop going to museums when your parents and school teachers stop taking you. You start going again when you have kids of your own. So what is going to make you come in while you are a ‘young person’? This is something which really troubles me as somebody teaching mostly 18-30 year olds from within a museum of rural life. I went to a fantastic ‘Steampunk’ exhibition at the Museum of the History of Science in Oxford a few years ago which was packed with people in the 18-30 bracket. More recently I found myself as part of a Nerdfighter gathering, in which I was one of the oldest people, at the STEAM Museum in Swindon. I was there to see John and Hank Green, who have found a variety of ways to get young people interested in history, science and culture online. Not all young people are geeks but thinking and marketing geeky clearly expands your audience from the perspective of age. It can also be the catalyst for new questions and displays of creativity. As somebody marching on through their 30’s I am sad to say that I am no longer in the ‘young person’ demographic. However, I would define myself as a bit of a geek. In light of this I thought that I would combine my two passions and write a series of posts about things which link the geeky and the museological. 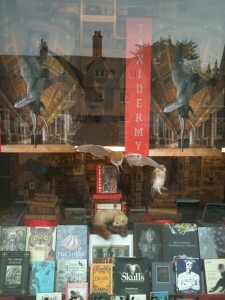 Next post on Nerdfighters and Brainscoop. So the Bank Holiday was a lot more about sitting in the sunshine than being a culture vulture. However, I did go to the Beer Festival which had live music from local bands all night and beer…obviously. The music has a bit of a blue grass feel and some of the acts from ‘Are You Listening?’ Festival popped up again. I decided to be patriotic and drank Welsh, which was also a chance to revive my Welsh GCSE. Brewers seem keen to fox the English with Welsh names i.e. I vaguely recall seeing an ‘Ysbyty Seidr’ (Hospital Cider) there before. ‘Cwtch’ means cuddle so you had to ask the bartender for a hug in order to get a pint of that. My favourite name was the cider ‘Gwynt y Ddraig’ which I believe means something like ‘Breath of the Dragon’. I don’t know whether it’s everybody’s idea of cultural activity but it is a pretty big date in the Reading calendar and CAMRA have an interesting place in sustaining our brewing heritage. I remember one museum curator told me that they got CAMRA members to help out with a display on the local pub in village life which is a really nifty way or interacting with different kinds of organisations. 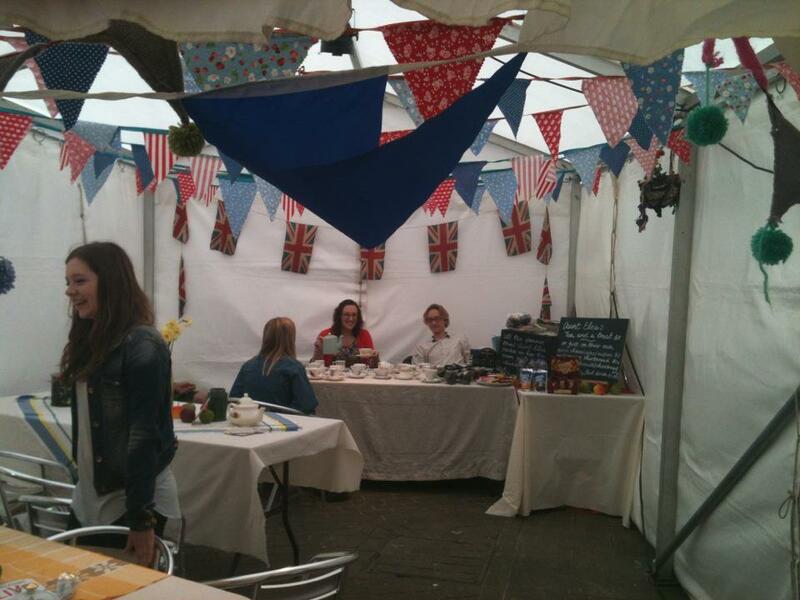 I was a little more refined at Aunt Elsie’s Spring Fling which was held in Market Square in Reading. 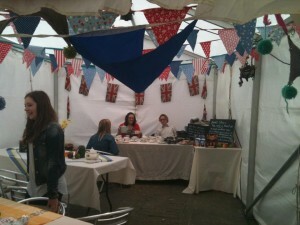 Tea and bunting, vintage clothes and furniture, local arts and crafts – yay! 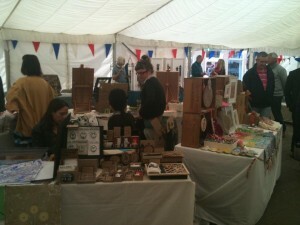 It’s a really great show case for local makers. When I wanted to try on a vintage dress from Alexandra Vintage I ended up strolling into the HQ of the organisers 42 Market Place where there are open days and workshops. One of the affiliated organisations Jelly has been around for ages (I still call it by its original name ‘Jelly Legg’d Chicken’) finding space for art and artists around Reading. It has parallels in the wider ‘slack space’ movement. This is an interesting phenomenon where artists and makers set up shop in disused retail spaces, and it seems to flourish in times of recession. It certainly brightens up the town centre to see art instead of ‘for rent’ signs and piles of bills through the windows of disused outlets. I’ve come across another nice example Slack Space Colchester. I have made it a mini-mission to uncover some more detailed research on ‘slack spaces’ and these kinds of community art projects, specifically how museums may support them. When I hunt down some more information expect another post. 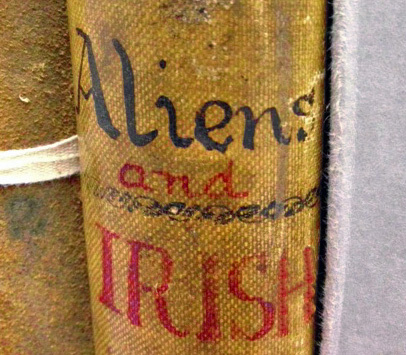 I’ve had quite a ‘cultural week’ which gave me the idea for a series of blog posts. Being so close to Oxford and London, Reading can sometimes feel a bit like a cultural ‘Narnia’. However, this week reminded me that there are lots of committed and talented people doing things in the local area. These blog posts will highlight some of the stuff that’s available to the culture vulture. NB there will be no attempt to be comprehensive – just things I hear about/go to. That being said, if you tell me about things then I am more likely to attend and talk about it. Also these are not intended to be artsy critiques, just some info and musings. Lisa Dwan performed Samuel Beckett’s rarely staged ‘Not I’ in the Minghella Building at the University of Reading last Friday. We got a chance to see the original manuscript and I would recommend following Lisa on Twitter, she’s got some interesting behind the scenes photos. The play was just under 10 minutes long but it was really hard to get a sense of time or space in the darkness as ‘Mouth’ talked incessantly from 8 feet above the stage. I came out feeling shellshocked but in awe of Lisa Dwan’s performance. It’s something I would never have thought of going to see before I came to Reading, which is why it’s so great to have the Beckett Collection on campus. The other event was the ‘Are You Listening?’ Festival. For £10 (which went to Mencap) you could listen to local bands at a range of venues around the town. Of what I saw I can recommend The 3.1419 Wonders, Quiet Quiet Band, and Tail Feather. Damien a Passmore and the Loveable Fraudsters’ ‘garage-country’ or ‘CowPunk’ take on Warren G’s Regulate was brilliant. I also listened to and liked, but did not see, Sophie Henderson through the floorboards of the excellent cafe Milk while munching on my chocolate and banana cake downstairs. The festival was a bit ‘men with guitars’ heavy so it was nice to have a talented female singer songwriter on the programme. And finally last night I went to something organised by the University of Reading Department of English Literature and the Berkshire Record Office last night. Oscar Wilde made Reading Gaol famous but this exhibition and event looked at the internment of Irish detainees following the 1916 Uprising. The ‘Enemies of the State’ Project is an interesting example of how research, collections and public engagement can come together. There was also nice veggie food and a live Irish band which is always a good thing.